This example shows you how to use CAN channels to transmit and receive CAN messages. It uses MathWorks Virtual CAN channels connected in a loopback configuration. Create a CAN channel to receive messages by specifying the vendor name, device name, and device channel index. Use the get command to obtain more detailed information on all of the channel's properties and their current values. Use the start command to set the channel online. The example function generateMsgs creates CAN messages and transmits them at various periodic rates. It creates traffic on the CAN bus for example purposes and is not part of the Vehicle Network Toolbox™. % generateMsgs Creates and transmits CAN messages for demo purposes. %   periodic rates with changing message data. % Copyright 2008-2016 The MathWorks, Inc.
% length is given for each message. % Create a CAN channel on which to transmit. % Register each message on the channel at a specified periodic rate. % Start the CAN channel. % Run for several seconds incrementing the message data regularly. % Increment the message data bytes. % Wait for a time period. % Stop the CAN channel. Run the generateMsgs function to transmit messages for the example. Once generateMsgs completes, receive all of the available messages from the channel. Use the stop command to set the channel offline. MATLAB® provides a powerful environment for performing analysis on CAN messages. 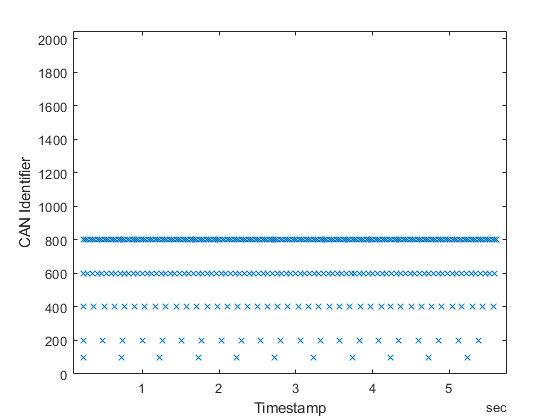 The plot command can create a scatter plot with message Timestamps and identifiers to provide an overview of when certain messages occurred on the network.